Cup washers fell out of diff? Thanks in advance. I am working on prepping my new diff for installation in my 1975 and got the mating surfaces on both halves cleaned up and was cleaning the bolts and washers and decided I would remove the stub axles to replaces the seals and inspect the axle ends and install new c clips. I got the small keeper bolt out, the center pin fell out easily, but then two "cup" washers also came out. They look like they may fit under the smaller toothed gears that the center pin slides into as the inside diameter is the same as the pin. My problem is that they came out very easily with just gravity when I turned the assembly, but I didn't see from where and I can't seem to figure out how to get them back in? I don't want to reassemble everything else until I know they are where they are supposed to be. they are behind the smaller gears as you mention or spider gears. Yes, thanks for the note. I was just reading that they are the spider gear thrust washers. I can't seem to figure out how to reinstall them though. They came out easily enough when I hand turned the assembly. Any ideas, or do I need to disassemble more items to get access? Yes those cup washer go between the spider gears and the posi case and will fall out when you least need them to....get the case in a position where you can get a washer in...align the spider gear with the cross shaft hole....jamb it in and install the shaft.....rotate posi housing to allow washer access for other gear...push cross shaft out....jamb the final washer in and check cross shaft position making sure you have hole for retainer bolt correctly oriented and get shaft into case....install reatainer bolt with red locktite....your done! You might have to use an aluminum or brass punch to get final washer fully placed behind the gear. Thank you Solid! It looks like the best position is the smaller window in the carrier as the spring pack is not in the way. I'm still beside myself wondering how they came out so easily, but are such a bear to get back in. I don't have a brass or aluminum punch, but may try my small steel punch very, very slowly. Any other techniques are appreciated for sure. Thanks again Solid. I was able to get them back in fairly easily after a small tap with a small screwdriver got them started. Then I promptly installed my center bolt and the keeper screw to make sure they didn't come back out. I was patting myself on the back with a beer after I noticed I didn't put the axles and c clips back in! Not too bad after I knew what to watch for the second time. I did use some heavy duty marine grease on the axle bearings before I reinstalled them. I don't know if this was a bad thing or not, but I had sprayed the whole thing with a can of brakleen and the bearings were thirsty. Hope it doesn't cause me any issues down the road, but it seemed like the correct thing to do. New seals too. Now I'll button everything up and paint. 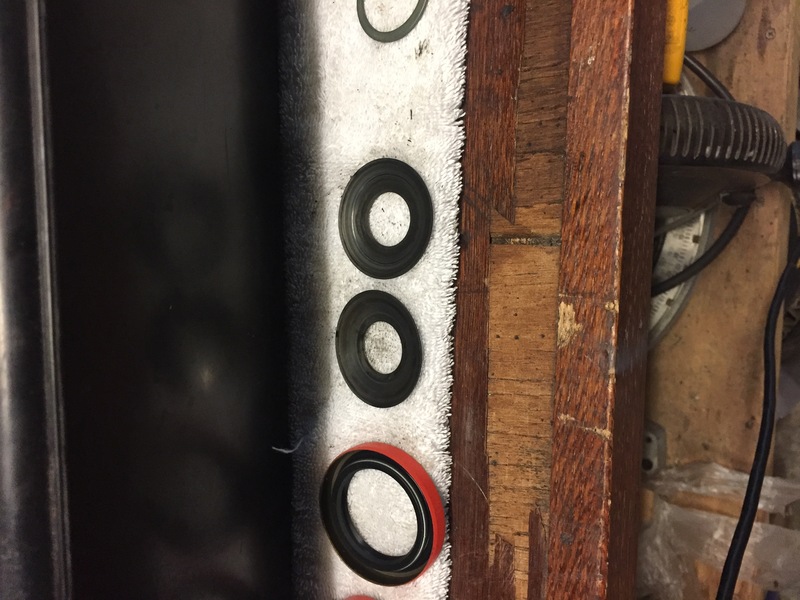 Quick Reply: Cup washers fell out of diff?